San Francisco designer Yves Béhar of fuseproject has unveiled Mission One, the world's fastest electric production motorcycle. 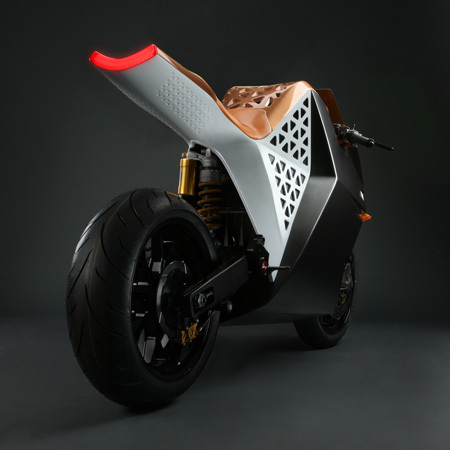 Designed for Mission Motors, the bike was unveiled at the TED 2009 conference at Long Beach, California, today. The bike has a top speed of 150 MPH and an estimated range of 150 miles. LONG BEACH, CA - February 4, 2009 – On February 4, Mission Motors will unveil a revolutionary new vehicle at TED 2009. The Mission One promises to be the world's fastest production all-electric motorcycle. Mission Motors CEO, Forrest North, along with lead designer Yves Béhar, founder of fuseproject, will present the vehicle in development onstage to the entire TED audience. Mission Motors will exhibit the vehicle throughout the conference at the Kohler LivingHome at the Long Beach Performing Arts Center, and will be on hand to discuss the company’s vision for a radically new brand of motorcycles. The company will also provide attendees the opportunity to see inside the product development process through the installation of a motorcycle design studio inside the Kohler LivingHome. “The Great Unveiling,” the TED2009 theme, makes a fitting platform for the launch of Mission Motors’ first vehicle, the Mission One. It is the first production electric sportbike that features uncompromised performance and an iconic new design created by world-renowned designers Yves Béhar and fuseproject. With a top speed of 150 MPH and an estimated range of 150 miles, the Mission One rivals gasoline sportbikes while dwarfing the performance of any other electric motorcycle on the market. The electric drivetrain creates a riding experience unlike anything currently available on a production vehicle. The electric motor’s linear torque curve provides peak torque at zero rpm, a feature gasoline engines cannot match. The motor delivers faster acceleration than most gasoline sportbikes without ever having to shift gears. The announcement formally debuts Mission Motors, a San Francisco-based company geared to redefine the world of performance motorcycles. The company was founded in 2007 by entrepreneurs Forrest North (CEO), Edward West (President), and Mason Cabot (VP of Engineering).